Nutrient solutions require regular management. There are meters to measure the strength (conductivity) and pH of the solution and there are solutions to make adjustment. It is all pretty straightforward once you have the hang of it, but it is a big part of getting things right. Nutrient Management - more information (MS-Word document). 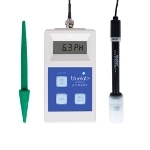 A conductivity, pH and temperature meter all in one. A completely original approach to Electrical Conductivity measurement. A rugged, reliable and affordable pH meter. Hanna's budget model pH meter. A benchmark Electrical Conductivity meter. This is the waterproof version of the famous pHep pH meter. A buffer solution set at pH 4. A buffer solution set at pH 7. An acidic solution, used to adjust the pH of nutrient solutions downward. A best selling and extremely high quality pH meter. A simple and inexpensive way of measuring pH. An alkaline solution, used to adjust the pH of nutrient solutions upward.